Season 4, Episode 7: Float Your Boat! Welcome welcome welcome! If you missed Episode 6, Float Your Boat, watch it here. As usual, do not miss 5 Moments on Drag Ya Later with Jon & John! And now for the main challenge, which was a bit of a Pride jumble this week! First the queens get a quick review of the 1969 Stonewall Riots as a defining moment in the gay rights movement. Then the queen’s get the week’s assignment: design your own fashion forward boat-shaped floats to show off Pride with one of the eight colors from the original Pride flag: Pink, Red, Orange, Yellow, Green, Turquoise, Indigo and Purple, with the overall theme being “Hope Floats”. Judging the runway this week are Michelle Visage, Billy B, LA Pride Grand Marshal Kelly Osbourne and NCIS’ Pauley Perrette. As for the runway, Jiggly keeps describing her float as, “Very Saint Tropez,” which may just mean, “Very orange” and Latrice really turns out the hair and makeup. 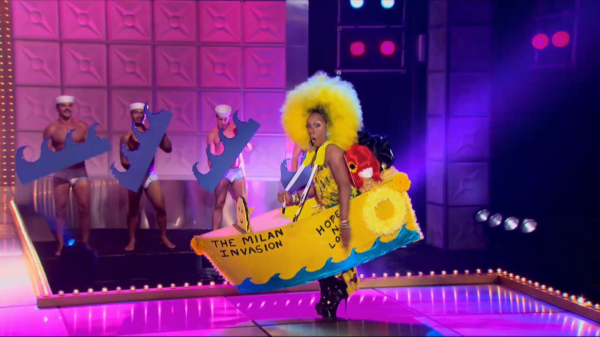 Milan describes her boat as the drag invasion of Fire Island. Michelle says Milan’s concept doesn’t show up at all in the final product. Billy goes farther, saying this boat showed off Milan’s pride instead of Pride. “I’m a little offended,” Billy says. Willam wins while Jiggly Caliente and Milan Lip Sync for their lives! As always, check out Pandora Boxx’s NewNowNext Recap and thanks to AfterElton for some fab photos! Here’s a reminder of where we stand…. We’ll see you next week for a recap on the RuPaul’s Drag Race Episode 7…READING IS FUNDAMENTAL!